Manufacturer of a wide range of products which include mezzanine floors. We are the leading manufacturer of Mezzanine Floors and our product is made of good quality. Warehouse and offer the best way to optimize the available space. Stair Case steps can be established as per the distance between the ground floor and Mezzanine Floor (Type: Straight, with single Intermediate landing, “L” shaped,” U” shaped). In includes tubular pipes & handrails. The cladding is fixed to the underside to avoid object falling off the mezzanine. It is the beside the boundary of the mezzanine floor. The defensive railing comprised of rectangle tubes connected together by clamps attachment. Location or size can easily be modified. 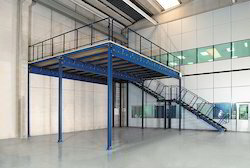 Looking for Mezzanine Floors ?